Metal maniacs, rejoice! I am proud to present to you: MALIGNER; signed via Blood Harvest Records, hailing from Swedish grounds - performing Death/Thrash Metal, on their debut album entitled: “Attracted To Annihilation” (released August 31st, 2018). Since formation in 2015, the band in question have only a Demo and EP and this here album in their discography so far which is entitled: “Attracted To Annihilation”. 8 tracks ranging at around 30:11; MALIGNER arrange an intricately designed formula of hard-hitting heaviness, amalgamating the Death/Thrash Metal sub-genres with concretely gritty developments. Beginning the record with the battering “Oath-bound”; the band blisteringly hammer with furiously composed aesthetics of bouncy relentlessness and speedy savagery, chugging and galloping away like a frolicking stampede of sinister proportions. Catchy creativity manifested with meticulous melodies and thumpy thunder, energetically convey distinctive contrast of flamboyant ramifications. Consisting of Maligno on Bass/Vocals who consistently contributes an audible attribute of pounding persistency and a raw injection of guttural growls and diligent expertise in the adrenaline fuelled “Lust For Fire”; guitarist Aztiak demonstrates complex dexterity in the killing track “Disposable”, distributing distinguishable characteristics of efficiently excelling madness. Powerhouse drummer Ertheb Somus-Ra establishes crunchy pummelling adroitness which portrays organic substances of fluidly polished solidity, showcasing rapidly swift nimbleness and skill. “Salvation” generates groovy and captivating songwriting proficiencies, perfectly managing to keep me entertained with enlightening and fulfilling originality with some progressively technical ultilizations. “Reign Of Fear” continues the assault of rampaging onslaughts that embellishes on uzi slamming weaponry, inventively initiating on unceasingly intense salubriousness. Exemplifying on riveting raspiness and gnarly efficaciousness, “Beyond Repair” supplies more heart-racing action as the band balance with perpetual vehemence and blood pumping excitement. “Mental Breakdown” is exactly what is says on the tin, a prolific meltdown of unrelenting stimulation and enjoyably crafted stability - sonically lifting in every sense. 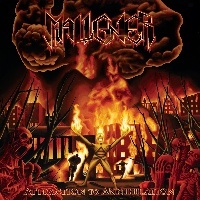 Overall concluding the record with the epic finale of “Into Oblivion”; I enjoyed a destructive discovery as MALIGNER certainly outdone themselves with this one, while short it was definitely savage and all Death/Thrash Metal fans will relish - check it out.